A general view of the Spozhmai Hotel following an attack by Taliban militants on the outskirts of Kabul on Friday. Heavily armed Taliban insurgents attacked a lakefront resort near Kabul overnight, killing at least 21 people during an assault and 12-hour standoff with combined Afghan and NATO forces. 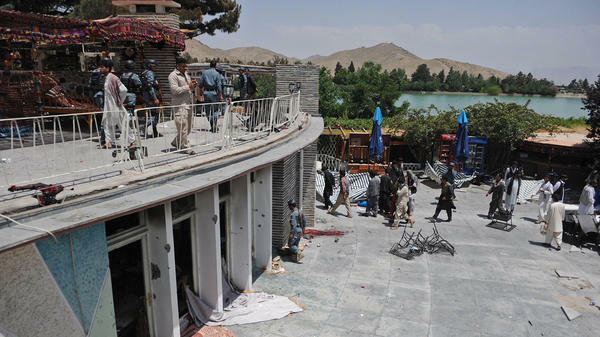 The attack occurred at the Spozhmai Hotel on Lake Qargha, a popular recreation area for upscale Afghans just outside the capital. The Taliban claim they attacked because it was used by wealthy Afghans and foreigners to engage in "immoral activities." Afghanistan's Ministry of Information updated the death toll to 21 — 17 civilians, one policeman and three security guards. Earlier, the figure had stood at 18. The four assailants were also killed. "Taliban fighters wearing explosive vests and carrying a range of weapons killed three security guards as they stormed the resort. Diners on the patio, some of whom were celebrating a birthday party, say they heard gunfire and then suddenly they were attacked. At least one attacker detonated his vest. "More than a dozen civilians were killed and many more injured. Some fled to safety, and around 40 people were held hostage for hours until Afghan and NATO forces killed the attackers. Afterward, the dining area lay in ruins, with bodies scattered around." "Some of the guests jumped from the window into the hotel yard. They were hiding under trees or any safe place they could find. Three of the guests jumped into the lake and hid in the water," Mohammad Zahir, criminal director for Kabul police, was quoted by The Associated Press as saying. The hotel was especially busy because Thursday evening, the time of the attack, was the beginning of the Afghan weekend. The BBC quotes witness Maihan Saeedi, who left the area shortly before the attack began, as saying the hotel was full of civilians, including women and children. "When we left the hotel, we heard gunfire as we reached one of the [three security] checkpoints near the hotel," Saeedi told the BBC. According to the AP, the attack was "the latest in a string this week that suggest the [Taliban] ... is pushing hard with its summer offensive rather than waiting for international forces to draw down." Taliban spokesman Zabiullah Mujahid said the hotel was targeted because foreigners there were drinking alcohol and participating in other activities banned by Islam, but that was disputed by the Kabul police. "That is totally wrong," Zahir said, according to the AP. "These are people who had worked all week and had gone to the lake to have a restful dinner with their families. The view there is very good for relaxation. There is no alcohol." Approximately 40 were held hostage. Rasul Khan, 10, was working in the restaurant at the time of the attack. He said the insurgents shot a man standing next to him. "I was terrified and went to the lobby and hid under a table for several hours," he said. "I was watching the attackers. They were walking around and were talking. Later on in the morning the lights went, and I managed to get out of the compound." "I was in a room when two gunmen came to me," said Abdullah, 14, who was also working in the restaurant. "[They] told me 'show me where the adulterous bastards are.' "
Abdullah, a student from Jalalabad who said he was working in the hotel for the summer, said he told the men he didn't know anything and that the assailants questioned someone else. He said he hid in a room through the night as glass rained down from exploding grenades. After the attackers' initial siege, a gunbattle lasted for about six hours. During that time, Afghan police and army personnel flocked to the area, with support coming from NATO, including Norwegian Special Forces troops. Black Hawk helicopters circled above. Officials said they held off on a frontal assault out of fear of wounding or killing hostages, and so far there are few details about how the siege ended. At least one of the attackers detonated his explosives vest, and the others were finally killed. The assailants apparently drove to the scene in a van full of explosives, but Afghan forces were able to safely detonate the van before the insurgents could blow it up. "It was one of the worst attacks of its kind, because the terrorist Taliban targeted a safe picnic place in Kabul," Ministry of Information spokesperson Sediq Sediqi said. "For them it was a very soft target."